Cadence is another name for bike pedaling speed. 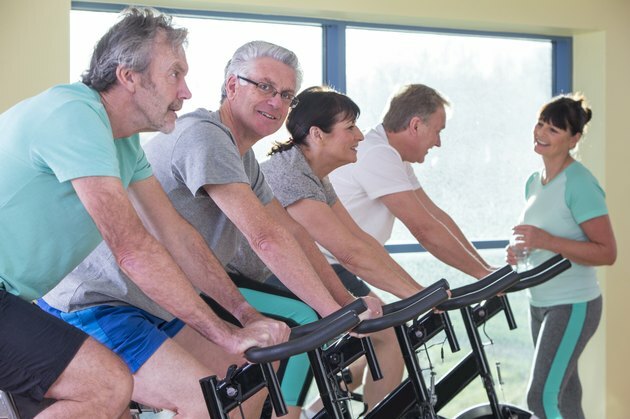 The average cadence on an exercise bike usually ranges between 50 and 110 rpms, depending on the rider, the resistance on the bike and the goal of the training. Beginners and occasional riders usually ride somewhere between 50 and 60 rpm. More advanced riders, especially those riding bikes with weighted flywheels as opposed to motorized exercise bikes, ride closer to 80 or 100 rpm when simulating level terrain. If you increase the resistance on the bike to simulate a hill, it becomes more challenging to maintain a fast cadence. When at a high level or resistance, the average cadence should be 60 to 80 rpm, notes Mad Dogg Athletics. A fitter exerciser can keep this cadence up at higher levels. If you can't maintain a resistance of 60 rpm, then the level of resistance you have on the bike may be too much for you and you risk injury to your knee joint. If you can easily pedal faster than 110 rpm, you're probably working at a level that is too easy for your abilities and need just a bit more resistance to get an effective, safe workout.